I have always ensured that I include healthy probiotics in my diet. My usual source was natural yoghurt, so once I went dairy free I needed to find a substitute and sauerkraut was it! Consuming probiotic foods is a great way to balance the good and bad bacteria in our digestive system, fight off yeast infections and reduce inflammation. Lacto-fermentation is the process used to pickle vegetables. It works because bad bacteria can not survive in the salty brine and once they die off the good bacteria can work their magic. The good bacteria change the lactose and other sugars into lactic acid and consequently preserve the vegetables by creating an acidic environment. I started with this simple sauerkraut recipe and now change it up each batch – with a mix of purple & green cabbage and adding carrot, apple, caraway seeds, fish sauce or chilli for flavour. 1. Cut out cabbage core and discard. 3. In a clean bowl dissolve salt in filtered water. 4. Loosely fill a large clean glass jar with cabbage. 5. Pour salt brine over cabbage and use a clean spoon to push down on the cabbage to get rid of any air bubbles. 6. Loosely place lid on top and put jar on a plate to catch any juices once the fermentation starts. 7. Leave at room temperature for 3 days. During this time remove the lid and make sure the cabbage is completely submerged in the brine, top up with salt brine if it is not. You can start to get excited when tiny bubbles start forming on the surface, this means the magic is happening! 8. At the end of the 3 days the kraut should be ready! It should smell and taste a little sour. 9. Tighten the lid and place the jar in the fridge for an additional 5 days to increase the probiotic properties and flavour. Keeps in fridge for up to 3 months! 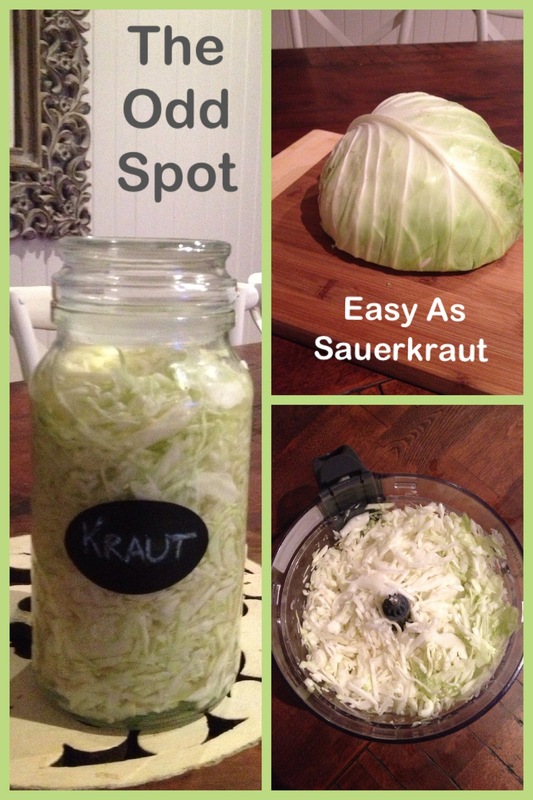 So there you go Easy As Sauerkraut without the nasty preservatives found in many store bought versions and much cheaper!